The two Semi Final games were between East Linton versus Haddington and Athelstaneford versus Yester; last year's winners. The first session produced a comprehensive win for East Linton over Haddington whilst the other game ended in a peeled game of 6 shots each with a draw shot challenge to follow for the two skips; neither stone needed sweeping and both just held on at the back of the rings to give Athelstaneford the game by the narrowest of margins. The start of the final had to be delayed as one game had just finished before the bell went for the next session. In the final Athelstaneford with J Shedden, K Stark, D Scott and B Bowie took on the East Linton rink composed of R Aitken, P Neison, J Black and A McCrone. Athelstaneford started strongly with a 1 in the first end followed by another 1 in the second end. Unfortunately that was the end of play for Andrew McCrone the lead for East Linton who had to withdraw through injury to his back and the game carried on. In the third end the 3 curlers from East Linton appeared on the board for the first time with a hard earned 1 shot. The game heated up and with some excellent play and they levelled the scores with a further shot in the fourth end. Athelstaneford then stole the lead with some magnificent play in the fifth end; but not to be outdone East Linton bounced back with a 1 to level things in the sixth end, going into what was to be the final end peeled. The final end saw a number of Athelstaneford stones sitting around the button but a brilliant last stone from Robin Aitken of East Linton nestled against these to take shot. This then left the Athelstaneford skip Johnny Shedden to draw with his last stone to move the East Linton stone and lie to take the end and the game; the stone looked right on track to achieve the desired result but in the end just marginally run out of steam to nestle close to the button but not enough to dislodge the opposing stone. A brilliant final which was a credit to both rinks and one which the small contingent of spectators thoroughly enjoyed. Congratulations to Robin and his rink in what was a momentous occasion for East Linton having only won the Royal Bank of Scotland Quaich once before back in 1995 when the trophy was first presented. Our thanks to all who took part over the three days of competition. The Bonspiel was once again played in good spirit on very keen ice. After a close win in round 1 against Haddington 2 (The defenders) Athelstaneford, fortified by their soup and sandwiches went on to teach another (nameless) club a harsh lesson. Overall the Athelstaneford 1 Team of Johnny Shedden, Shelagh Main, A Kerr and A Young were clear winners with a total of 23 shots up. Runners up were Dirleton on +5 shots and Aberlady with +4. Athelstaneford now break clear of Dirleton and Whittinghame into a clear second place, behind Haddington for the overall number of wins since this trophy was first competed for in 1859. Conviviality continued (as apparently did checking of mobile phones) in the bar following the games. The second Knockout games see Athelstaneford and Yester go forward into the Semi Finals where they join Haddington and East Linton. It was a close run contest on the new ice at Murrayfield this year with both provinces winning two games (and losing two games). The scores on ice saw a two shot leading margin for East Lothian BUT we were given a 2 shot penalty for having a player arrive late. The final adjusted scores saw East Lothian 27, Borders 27. The Borders retain the trophy for another year. NB Last year East Lothian was penalised for being one player short, which also had a bearing on the destination of the trophy. ALL clubs should ensure that their players turn up in plenty of time and to allow for traffic. A big congratulations to the East Linton team of Robin Aitken and Paul Neison who beat the Haddington Team of Dave Munro and James Pate in the High Road Final. The Low Road, this year was won by Dirleton's Callum Harvey and Graham Elder who beat Yester. Congratulations, but no cigar, to our East Lothian Team. We were edged out into second place this year by Midlothian who finished with a score of +10 shots. Thanks to a high scoring win in the last game by James Logan and his rink, East Lothian finished 2 shots behind on +8 shots. This was held on its traditional date of the first Friday in December 2018. 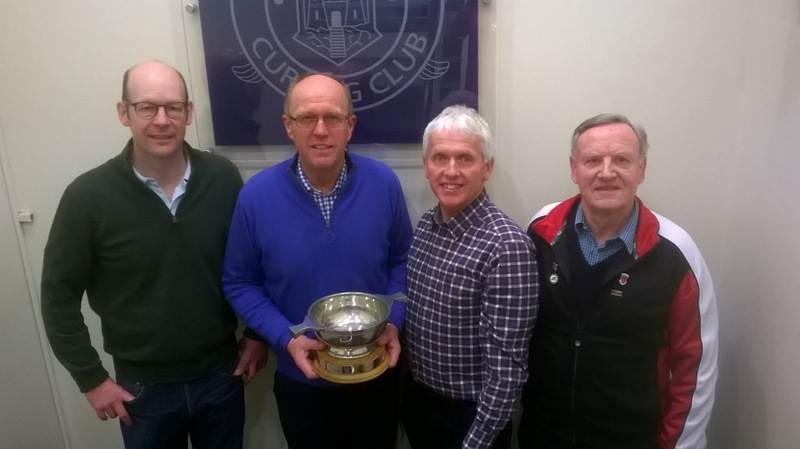 Two rinks from each of our three Provinces, Midlothian, East Lothian and Peeblesshire joined battle with two rinks representing RCCC/ScottishCurling for possession of the coveted "Black Bull" trophy. The RCCC/ScottishCurling rinks were unable to repeat their success of 2017, and Midlothian carried off the trophy. Basil Baird's rink was best placed individual team, with an overall score of +11 shots. As well as the main event, there was a separate "fun" draw shot competition, also won by Midlothian, emphasising their superior strength on the day. As with last year, the standard of drawing was ..... umm.... variable, with only 3 out of 32 stones thrown biting the button. The first Knockout games see wins for Haddington and East Linton.